1. Bold, Colorful Prints - The two bikinis pictured above are both from the Mara Hoffman Resort 2014 collection, which perfectly incorporates the top print trend for spring/ summer 2014. This season tribal prints are getting replaced with a more modern geometric and extremely colorful version. Here is a great one piece in the trend. 2. Blouson-Top Swimsuit - The blouson swimsuit trend comes in both a two piece or a one piece bathing suit. I think it's the perfect swimsuit for a pregnant woman who is just starting to show or who is maybe fighting that last bit of baby weight that hangs on the tummy. I like how it can be paired with bikini bottoms, or more coverage and tummy control, with shapeware swimsuit bottoms. I featured these two particular blouson swimsuits, because they're the most flattering of the other ones I saw, though it can be little deceiving to see them on such a slim model. Here is great example of what the trend looks like on the average body type. 3. Fringe Top Swimsuit - This is one of my favorite swimsuit trends, because it's such a boho-chic inspired look. The bandeau fringed bikini top in particular is perfect for a smaller bust. You can also get in on the trend with a fringed monokini. 4. Flutter/ Flounce Top Bikini - This is another swimsuit trend that grew last year and is still super hot for 2014. 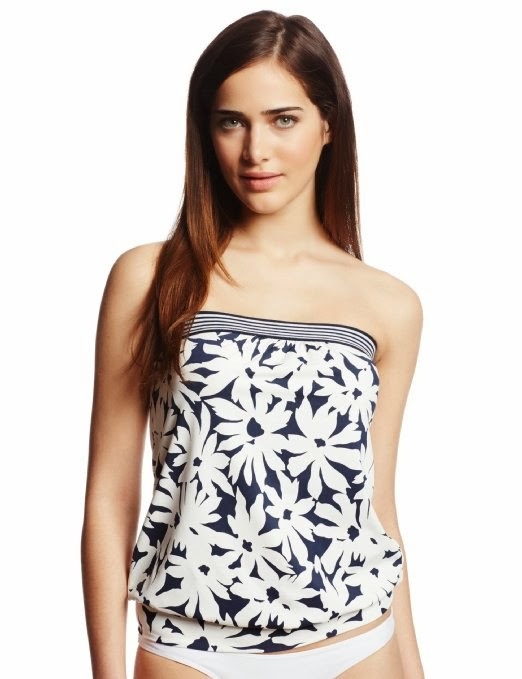 Whether it's a simple single ruffle or a large flounce cropped tank, the flutter swimsuit top cute and flirty. It's great for adding a little volume to a smaller bust, though it's can also be a great swimsuit for ample coverage on a larger bust, depending on the style. 5. Sheer Mesh/ Crochet - Oh golly jee, that's me on the left. What can I say, I LOVE my Leonisa Sophisticated Mesh One Piece in black (Photography by Clare Ahalt). It's not currently available, but you can find the trend on many other suits. The sheer black mesh swimsuit trend came back on the scene last summer and is still going strong for 2014. The sheer trend can also be found on crochet swimsuits. 6. Plunging One Piece Swimsuit - The monokini was incredibly trendy for 2013. This year however, the revealing one piece is all about the plunging neckline. It's the perfect swimsuit if you have a nice upper body but are a little self conscious about your waist. The plunging one pieces that are on the more conservative end, like the ones pictured above, often have light tummy control. 7. Bustier Bikini Top - The bustier bikini is the ultimate swimsuit for showing off a woman's body. Needless to say, it isn't for the body conscious. It's what you need to look at when you don't feel like doing your beach body workout! Luckily we can get in on the trend with a bustier-top one piece swimsuit. 8. Strappy Multi-Tab Bikini Bottoms - From ultra-strappy to multi-tabs, these swimsuits are all about the bottom and are often paired with a triangle or bustier top. 9. Rash Guard Swim Top - Rash guards, while practical for water sports, has become incredibly trendy for 2014. You can find them in either short or long sleeves and loose-fitting tees to skin-tight and cropped. 10. Bandeau Fashion One Piece Swimsuit - For those of us who would rather stick our heads in an oven than wear a bikini, there are plenty of fashion one pieces, most of which feature a strapless bandeau top. Find your new favorite suit in the Summer Swim Guide — plus, check out the latest sandals, sunglasses and more. Visit the Shop. Good way to add yourself into the mix, Krisztina!